Chemical exfoliants are incredibly effective for sloughing away dead skin to reveal a smooth, even complexion. Most chemical exfoliants on the market are either Alpha Hydroxy Acids (AHAs) or Beta Hydroxy Acids (BHAs). Each has a unique function that works best for specific skin concerns, so let’s break down those differences! Alpha Hydroxy Acids are naturally occurring substances found in fruits, milk and cane sugar. They are one of the gentlest, yet robust, exfoliants you can use on your skin. Lactic acid, mandelic acid, malic acid, citric acid and glycolic acid are some of the most common AHAs. AHAs are water soluble chemicals that exfoliate the skin by gently loosening the surface layers of dead cells. Essentially, an AHA helps break down the loose bonds between our skin and its dead cells, allowing our body to shed them. Though frequently misrepresented as skin-thinning, AHAs have actually been shown to promote thickness in the deeper layers of the skin. Generally, all skin types can use AHAs. What skin concerns do AHAs most effectively treat? AHAs have been shown to be beneficial in the treatment of uneven skin tone and texture, resurfacing scarring, hyperpigmentation, and acne. Some of our favorite AHA products are SLMD’s Glycolic Acid Body Lotion and Glycolic Acid Body Scrub. Beta Hydroxy Acids almost always refers exclusively to salicylic acid, naturally derived from willow bark. BHAs are oil soluble and, despite their name, are a bit tougher than AHAs. While AHAs exfoliate by loosening dead skin cells, BHAs exfoliate dead skin cells inside our pores, removing dirt and debris from within. They are ideal to use an initial step in a skincare routine, as they open pores up to receive other treatment ingredients. All skin types are typically fine using BHAs, with the exception of incredibly sensitive complexions. What skin concerns do BHAs most effectively treat? 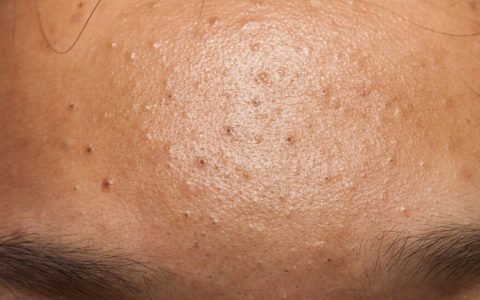 BHAs are most commonly used in the treatment of acne and breakouts, as their function within the pore is to loosen the bacteria and debris that cause breakouts. They are often used in combination with AHAs to provide a dual-action exfoliation, cleansing on the surface and within the pores. Our favorite cleanser made with the BHA Salicylic Acid is SLMD’s Salicylic Acid Cleanser. As with retinol and benzoyl peroxide, when using AHAs or BHAs, your skin will be more susceptible to sun damage. While you should always be applying an SPF in the mornings, ensure you’re wearing at least an SPF 30 while using any of these products. But once you’ve got your UV protection on, you’re set to exfoliate like a pro!